North Coast Endurance Coaching offers several training camps throughout the year. The camps focus on specific skills for your sport, workouts to push you to the next level, learning from your experienced coaches, and getting to know fellow athletes. Not only is it a great learning experience, but a really fun time! Our camps are affordable and extremely informative. You will be very satisfied with the coaches, the skills you learn, the training you receive, and the support staff who are there to make your camp fun and extremely valuable. We offer local camps as well as destination camps. 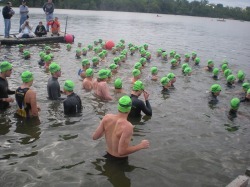 Local camps are held in the Midwest and feature group training in challenging locations. Destination camps are held in great locations around the world. Our 2014 destination camp will be held in Italy. Camps are held in cabins, hotels, or condominiums near where the workouts are conducted. Housing arrangements are based on the layout of the building that is being utilized. All the food is included for the weekend. Breakfast is buffet style with all the energy foods that you will need to fuel for the days activities. Lunch is usually on the road or between sessions. Experienced cooks will prepare a hearty and healthy dinner after the days activities. Energy food is available all day during the workouts courtesy of Honey Stinger. Workouts will include pool or open water swimming (depending on weather conditions), bike workouts that are challenging and scenic, and runs that will test the elite and uplift the beginner. Throughout the weekend there will be interesting seminars that teach you new skills, help you to train more effectively, and evaluate your technique in order to make you a better athlete. Numbers are limited between eight to twelve athletes with at least two coaches present. The Mountain Bike camp is geared for all levels of mountain bikers. Learn the skills to take you to the next level in your racing or just stay with the lead group on the trail. All campers will receive a bike fitting and a video analysis. Skill sections will cover climbing, descending, cornering, race tactics, foul weather adaptations, nutrition, and training tips. General conditioning as well as nutrition will be covered. The camp is held on excellent trails that have a variety of Midwest terrain to tackle. Our coaches are there with you to offer encouragement, tips, and the skills you need to go to your next level. Numbers are limited between eight to twelve athletes with at least two coaches present the whole weekend. Why should I attend a camp? Are training camps beneficial? Generally speaking, most amateur athletes have a lot to gain from training camps, whether it be learning essential skills, building fitness, or simply sharing time training hard with like-minded athletes. Here are some reasons that attending a triathlon training camp can be a great investment. Focused training without distractions. A training camp is like a get-a-way for athletes. You get to leave our regular lives behind for a few days and simply focus on the sport we love so much. No meetings, no kids, no obligations. You just workout and recover for the next day of training. Focused training found in most camps has a really positive outcome on athletic performance several weeks after a camp has ended. In person access to a coach, 24 hours a day. Being able to hang out with coaches and other athletes all day long offers a big opportunity to learn not only more about how to train for a sport, but also how this training applies to you specifically. Our coaches are always watching you as you train and will have tons of suggestions for improvement. Take advantage of the coaches at the camp you attend by asking a lot of questions. A learning experience. A training camp is a great opportunity to learn more about your chosen sport. Experiencing training and racing on a higher level that only a camp environment can provide, can give great insight into what your sport can offer you. There are many opportunities to learn new skills, training techniques, and the tricks that elite level athletes use out on the race course. You may also learn something about yourself as an athlete and as a person. Quality training. Camps are structured for you to be able really dig in and make serious progress in your training in a short period of time. This can be through long, hard days out on the bike, or as simple as an hour focusing on technique. The benefits of a training camp go far beyond what I can describe here. Please contact us if you have any questions.